The sndfile-tools package is released under the terms of the GNU General Public License (version 2 or version 3). The latest version is 1.03 and it can be downloaded here: sndfile-tools-1.03.tar.gz. It should be trivial to compile on Linux and relatively easy to compile on other Unices (including Mac OSX). Its probably possible to compile it on windows, but why would anyone bother? Create a sound file containing a swept sine wave (ie a chirp). -from <start>    Sweep start frequency in Hz (default 200Hz). 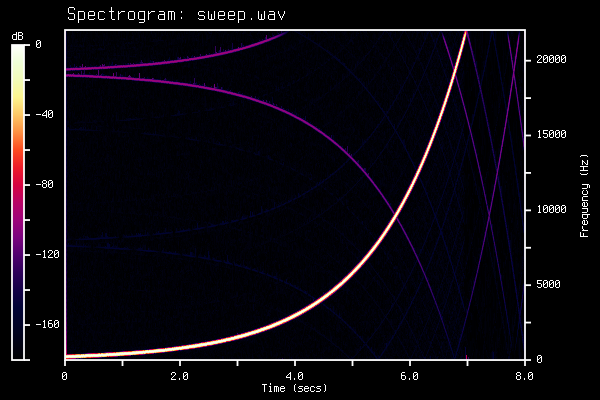 -to <end>        Sweep end frequency in Hz (default fs/2). -amp <value>     Amplitude of generated sine (default 1.0). The output file will contain floating point samples in the range [-1.0, 1.0]. of 'wav', 'aifc', 'aif', 'aiff', 'au', 'caf' and 'w64'. Play a sound file via the JACK Audio Connect Kit daemon. Generate a spectrogram as a PNG file from a given sound file. Convert a multi-channel input file to a mono output file, by mixing all input channels into one.